You know the routine. New popular toy comes out. It quickly vanishes from store shelves. And when it's finally in stock, you gotta line up. That was this morning, but with a slight twist and months of waiting. After breakfast earlier today, my whole family—all five of us—piled into the car and headed over to a very local Toys R Us in suburban Osaka in attempt to buy a Yokai Watch watch. Right now, kids in Japan are enamored with Yokai Watch. They love it! The anime and games have become incredibly popular, for the time being, even appearing to challenge Pokémon's hold on cute monsters. Yokai Watch features traditional yokai (loosely, monsters) from Japanese folklore as well as new ones created by game developer Level-5. Japanese kids love yokai, and Level-5 has tailored Yokai Watch to please the country's youth (which reinforces my theory that Japan is often at its best when it designs games and anime to suit local tastes). For what seems like months, my middle son, who is five, has wanted a yokai watch, which we had promised him for Children's Day if he continued to clean up and help around the house. He did, but we couldn't hold up our end of the deal. Damn us. Note: The yokai watch doesn't tell time. You put yokai medals in it, and it makes noises that correspond to the different medals. 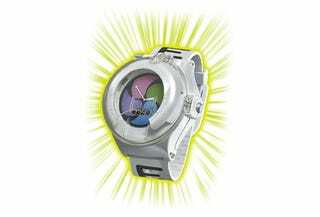 There's also a light you can shine on the side of the watch to "see" the yokai. Every time we went to toy stores, we checked to see if they are in stock, and they never were. He's even started phoning up Toys R Us to see if they have the watch in stock or if they are getting a shipment. For a five year old, he's gotten pretty good at calling Toys R Us. But, no luck. Either the store just sold out or didn't know when the next shipment was coming. Family friends were able to find a yokai watch, but alas, we kept coming up short. It is possible to buy a yokai watch right now on Amazon Japan... for double the 3,200 yen (US$31) retail price. That's for the deluxe version—the just released Type-Zero version is going for nearly $130. There are collectible plastic yokai medals, which feature the different yokai. For the longest time, it was incredibly hard to buy these little plastic pucks, let alone secure a watch. Recently, however, it's gotten slightly easier. Level-5, which until now was best known for Professor Layton, has been incredibly smart about the yokai medals. There is a Yokai Watch kiddy arcade game that is totally free—as long as you have medals. If you have medals, then you can play the arcade game. You don't even need to insert coins. Of course, the idea is that kids will buy yokai medals to play the game, so that's how they'll get your money. But the concept is rather brilliant: It's a monster battle game, and if kids win, the capsule toy machine that's connected to the arcade game will spit out a free capsule, which contains a rare yokai medal. That's why children line up to play the free game, which has rules like, one-play per person, etc. Like I said, it's rather brilliant. A few weeks ago, my middle son was rumaging around, looking for paper and scissors. I asked him what he was doing, and he said, "I'm making a yokai watch." Which he did. On the way to Toys R Us this morning, we took a poll in the car, trying to predict how many people were lined up. My oldest son, who's 11, said, "A couple hundred." I said he was crazy, and there would probably be sixty—which was the most I had ever seen lined up there (this was a few years back, for a Kamen Rider toy). When we arrived at our local Toys R Us, there were already over two hundred people in line. This line wrapped around the building. Still, to provide context, here are some photos of people over the past few months, lining up for yokai watches. These tickets did not guarantee we could buy either of these watches—simple math explains that. Instead, these tickets were so we could enter a raffle to win a chance to buy one of these toys. That's right. We lined up for a chance to win the opportunity to spend money. The above sign says that today this Toys R Us got in 36 deluxe yokai watches, and ten type-zero yokai watches. After getting our tickets, we had to keep waiting in line so we could then stuff them in ballot boxes for the raffle. Since there are five of us, including the new baby, our odds were okay, I guess. But still hardly great—thirty-six out of five hundred people could get the watches. We explained to my middle kid that he might not win, and he said he understood and that lining up this morning had been fun. Then, at 3pm today, the results were set to be announced. And the winners could then buy the yokai watches. And, finally, today at 3pm, we went to Toys R Us and read through this list, trying to see if our numbers matched. One of them did. When I presented my son with the yokai watch, I asked him what he was going to do with the papercraft he made. "Oh, I'll keep it in case this one breaks."